Polystone statue sculpted by very same artist who worked on The Hobbit: The Battle of the Five Armies! 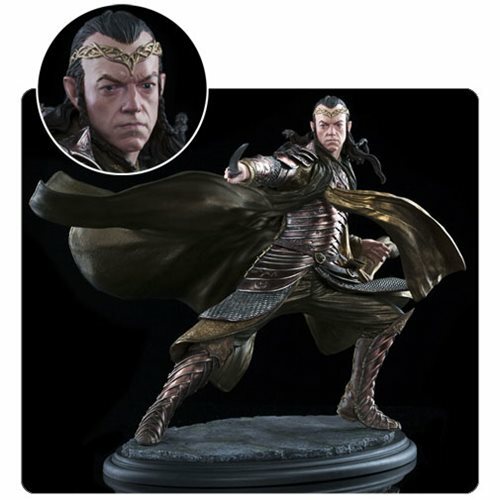 Gleaming in his burnished armor and swinging his mighty sword, Hadhafang, Lord Elrond stands against the fury of his blows as he and the Wizard Saruman meet the attacking Nazgul in battle at Dol Guldur. Sculpted by Weta artists, the very same artists who worked on the movies themselves, this polystone, hand painted statue measures approximately 11-inches tall x 18 9/10-inches long. A limited edition of 1,500 pieces, this statue is another must have in the 1:6 scale line from Weta Collectibles. Ages 13 and up.